This is one of our beautiful new mosaic stone tables. 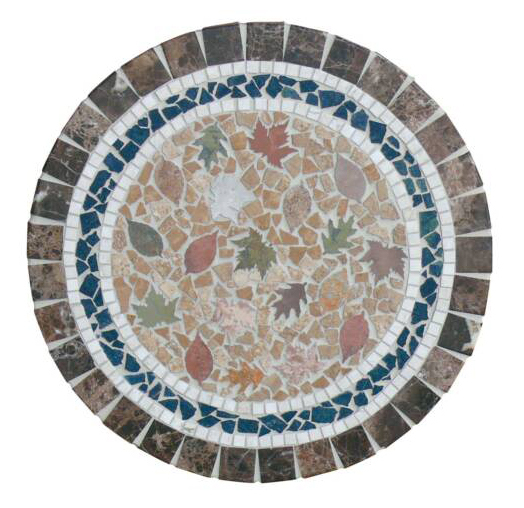 This particular pattern is called Autumn, ostensibly because the mosaic centerpiece consists of a mixture of multicolored earth tone pebbles, and autumn gold, red, and green stone leaves. The warm colors found in this makes this piece friendly, and inviting. It encourages you to gather around with friends and family and have real, good, honest conversations. This table is, as is our entire collection, built using a super light core which makes the table much less heavy than other entirely stone, or stone and wood pieces. Built for indoor or outdoor use, this table can be put into just about any location in or out of the home. It would be as comfortable on a short base acting as a coffee table, as it would on a taller base in an outdoor kitchen. The wide variety of soft colors means that it will fit most color schemes. This table is also available in 15 different sizes and shapes ranging from tiny 24X24 inch squares, all the way up to 84″X48 massive rectangles. This means that this table pattern can be used for anything from a small side table, all the way up to a massive dining table. The table is also available with an optional, natural stone base, which can be crafted in a matched pattern. These bases are also available in one of 5 designs. This entry was posted on Sunday, July 19th, 2009 at 8:04 pm	and is filed under tables. You can follow any responses to this entry through the RSS 2.0 feed. You can leave a response, or trackback from your own site.